The Haha ends. We leave Cabo. We head for the end of Leg 3. We bid farewell to the many of the other Haha boats and head for La Paz. At 150 miles away, we'll make it an easy 3 day trip. We'll find a safe marina for Wings, strip her of unneeded items, and leave her until Spring. The final night Baja-Haha party was fun and funny. 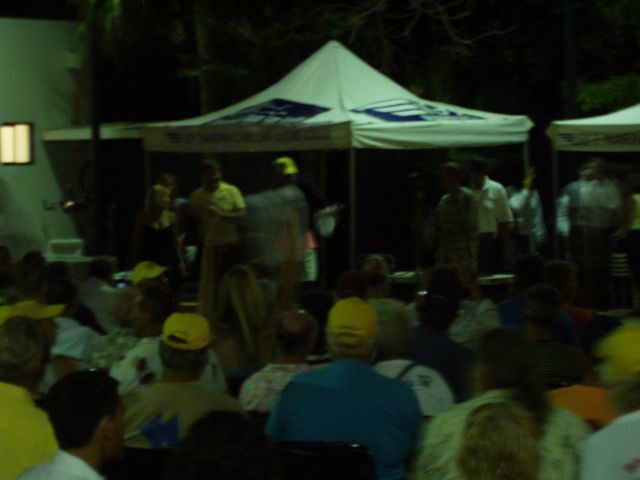 Richard, the Grand Poobah, is front and center, giving out some kind of award. All the yellow hats are the Haha hats that each person was given. 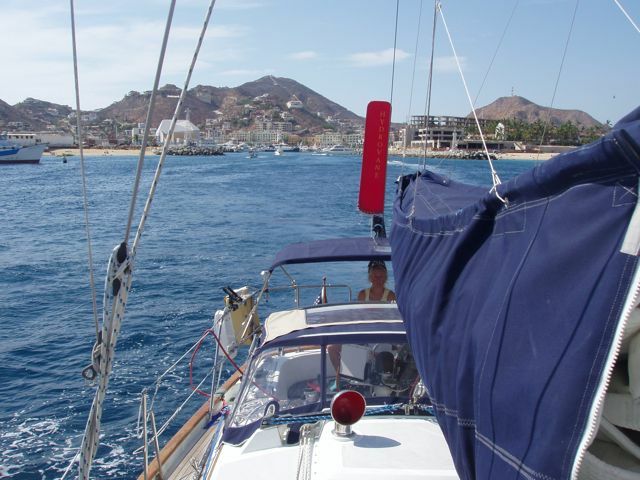 Conni at the helm as we leave the Cabo harbor. 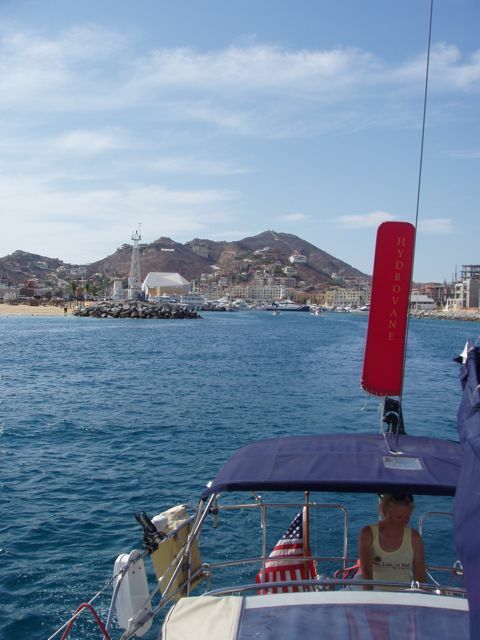 Another photo of leaving the Cabo harbor. At center left is Pedregal Hill, home of the movie stars. The Cabo public beach is called Medano, and we're looking at it at 1:30 PM. Many of the Haha sailboats were anchored off the beach since they did not want or receive a slip in the marina. Attending functions meant using a dinghy to motor into the harbor. 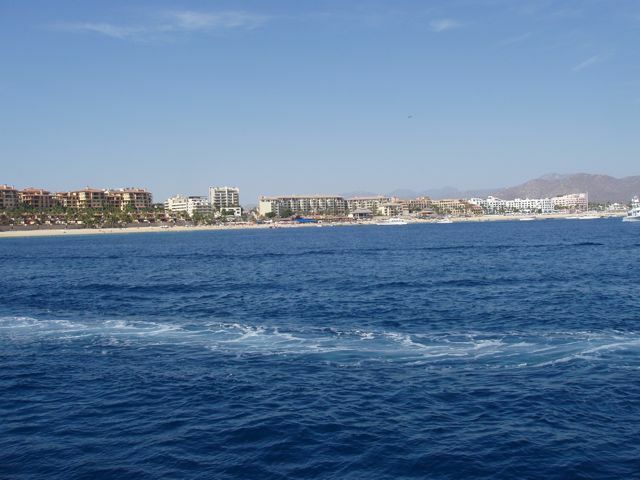 San Jose del Cabo from our anchoring location offshore. 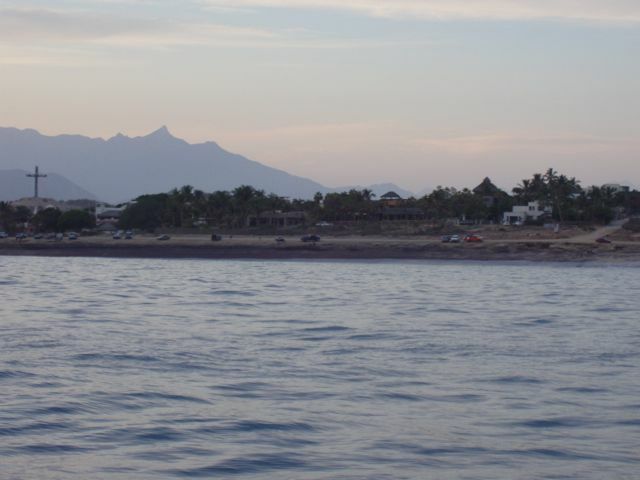 In the photo is the white beach bar at left and a huge cross at right. Rich. 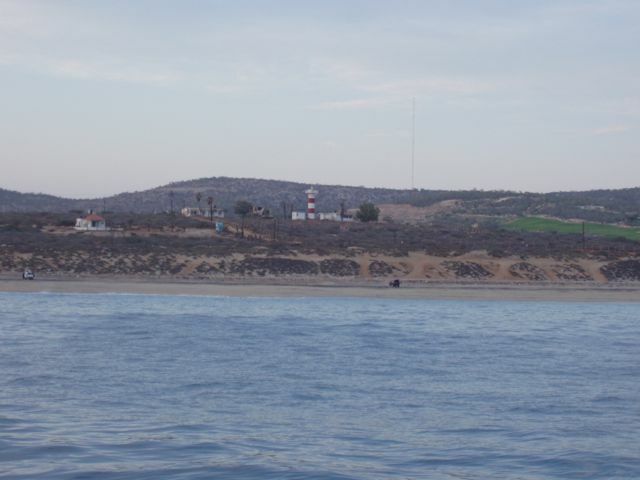 This peninsula upon whose tip rests Cabo Can Lucas and San Jose del Cabo (“Los Cabos”, or just “Cabo”) was long a dry spit of land inhabited by a few Indians who fished in the rich sea between their land and what is now mainland Mexico. But once Hernán Cortéz heard a rumor of this land rich in gold and pearls, he moved a few ships north from Acapulco where he had been raiding the famous Manila Galleons that traded Mexican Silver and Gold for the Philippine’s silk and spices. His ships arrived in 1535, and he found no gold, few pearls, and a group of Percu Indians that weren’t especially pleased with the arrival of these ‘new-worlders’. Cortéz´s ships left after a couple years, having gained only a decent new map of the newly-named Sea of Cortez. 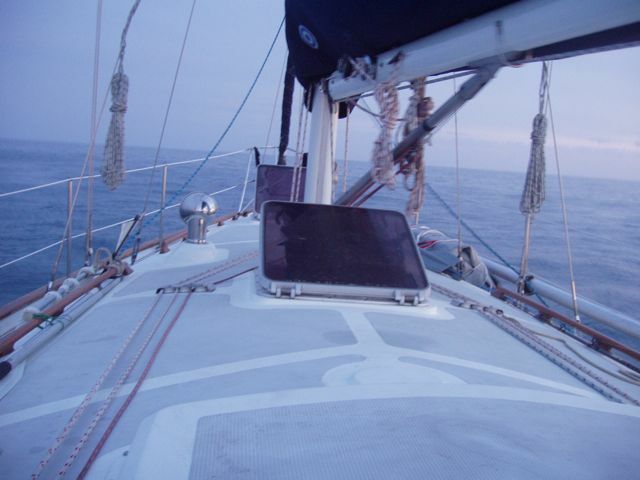 The area was on the sailing route between Acapulco and Asia, however, and therefore made a prime hang out for Dutch and English pirates hoping to intercept the ships of “New Spain” laden with goodies. Sir Francis Drake came to the area in 1587, and Thomas Cavendish raided the "invincible" galleon Santa Ana off Cape San Lucas in 1587, laden with so much gold that its capture depressed the London bullion markets for some time. For some reason unlit, this is a lighthouse at Los Cabos. What's level? I braced the camera on the dodger top and shot forward. We were rolling like a hog and I thought that it was an interesting view.